It is often said that time flies when you are having fun. Well, I can attest to that. The first year of my term is over and time is in high gear. I am grateful that my predecessors and the association saw fit to make the chairmanship a two-year position. A one-year term would now be ending, just as my perspective and understanding is expanding. Reflecting on my first year, it has been both a rewarding and educational experience for me. I have had numerous opportunities to visit members; some in open gearing, and some in closed gearing and others in support businesses. The diversity is inspiring. Each one is unique, and yet similar. The approaches to problems, the desire to achieve, and the entrepreneurial spirit are alive and well. It is easy to see that, from the smallest company with just a hand full of employees to the largest, the elements are the same fortified by the human asset. 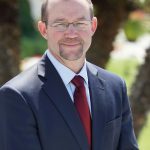 I have also gained a better understanding of what many of you value, as well as having heard your constructive input that can help the board add even more value to your membership. The economy seems to be on the mend, with growth and prosperity leaving the challenges of 2009 in the dust. The most common comment I hear is “when will it slow down?” or “we can’t keep up with the orders.” This in turn spurs investment and creates jobs, which are the medicine for the national economy. Over the last several years most of your companies have had to adapt to the dramatic economic swings. You tightened your belts, readjusted, refitted, and better positioned yourselves for the comeback and recovery. AGMA was no different, and was also adapting to the changes. In 2008 and 2009 the association responsibly curtailed programs to mirror the times. It adopted new ways to communicate replacing many face to face meeting with things like WebEx meetings, which have now become part of how AGMA conducts business. As the economy and its membership started to thrive again it took programs off hold, reevaluated and initiated new educational programs like the webinars, identified and introduced a new market research firm, IHS Global Insight, to provide industry forecasts and the new reports on 10 end-user markets and redesigned its Web site, which continues to flourish. The Strategic Resources Network (SRN), a group of up and coming professionals, has grown to be a vibrant part of AGMA’s future. Their goal—to perpetuate long-term viability of the industry and grow its future leaders—serves as an active forum for the young professional. Visit their Web site and you will be amazed by the resources that are available. If your company is looking to get some of your younger managers involved in AGMA, I would encourage you to talk to members of the Strategic Resources Network. You will quickly hear of the personal and professional benefits to this networking and educational program. AGMA also planned and launched its first International Conference in Budapest, Hungary, last September with great success. This meeting provided a great opportunity for members from at least 10 countries to open their minds, interact, and learn about themselves and each other. 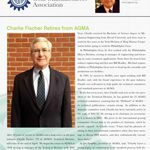 It is so gratifying for me to see the ability of the AGMA logo to bring different people from different backgrounds and cultures together to talk about topics important to each of us and to our businesses. I also have had a very unique insider’s view of what it takes to run a quality association. The professionalism and man hours that it takes to deliver a world class Gear Expo, what goes into planning meetings such as this one which will set a new watermark for attendance, with over 300 participating or the almost insurmountable logistics to stage international meetings such as Budapest and this year’s India delegation. All of these provide invaluable networking venues to build stronger relationships, both domestically and with international partners, that enrich business as well as those that participate. The association’s challenges are continually evolving. 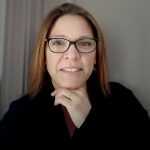 The workforce is changing almost as rapidly as technology, the demographics are shifting, and the focus is ever increasing to a world perspective. AGMA has identified and continues to identify these shifts and works to get out in front of the curve to have resources, programs, educational venues, and services in place. The association continues to be strong and vibrant, made possible by the selfless and countless hours of many of you. I would like to challenge each of you to encourage your younger employees and colleagues to get involved via the Strategic Resources Network or other AGMA avenues. It is a proven way to develop talent. It has been said that the sum of the parts can be greater than the whole. I am truly looking forward to the next 12 months, and I am excited to see where the industry will be next year. 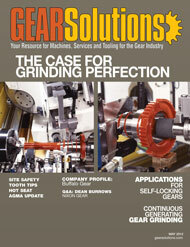 AGMA is your key to the gear industry and its trends. 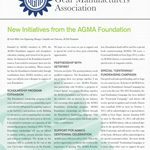 As the association mission statement says, AGMA is designed “to help you compete more effectively in today’s domestic and global marketplace.” AGMA has a variety of Benchmarking and Statistical Reports available to help you see where you stand in the industry. Members of AGMA have the opportunity to participate in all of these programs and reports free of charge, however only participating companies receive the reports. Taking advantage of these programs ensures that your company will receive valuable decision-making information. AGMA uses outside consultants to collect and compile the data for all of these programs, so that no other members or staff ever see individual company data. 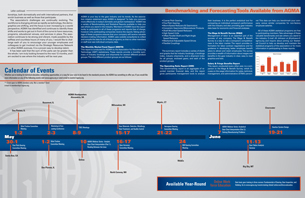 The summary report includes a variety of charts and graphs that list industry bookings, a bookings index, industry shipments, and a shipment index for all groups, enclosed gears, and each of the product groups. This benchmarking report is an aggregate of reported member financial data, and the report gives participants management tools to analyze their business. It is the perfect analytical tool for comparing an individual company’s performance with the industry and also providing gear industry data base for economic and financial analyses. Management of labor is an essential part of the success of any company. The Wage & Benefit Survey is a way to rate a company’s competitiveness in the labor market. The report provides information for labor contract negotiations and for guidance in developing better employee benefit plans to attract and retain employees. The survey provides a wealth of information about wages and benefits in the gear industry in clear, easy to read graphics and text. This report, conducted every other year, is a companion to the Wage & Benefit Survey, which focuses on the wage information for sales, technical, management, and administrative (STMA) personnel. This data can help you benchmark your company versus similar companies for non-factory employee salaries. All of these AGMA statistical programs are free to participating members. Take advantage of these valuable benchmarks and see where you stand in the industry. E-mail Jill Johnson at jill.johnson@agma.org and inquire about joining our Statistical Council to help us develop and maintain the statistical programs of the association or for more information in participating in these reports. China, one of the world’s largest economies, can be daunting when first looking to set up business partnerships. In 2011, China’s export of gear products topped US$ 3.84 billion and imported US$12.48 billion. Its export is expected to increase at 10 percent China, one of the world’s largest economies, can be daunting when first looking to set up business partnerships. In 2011, China’s export of gear products topped US$ 3.84 billion and imported US$12.48 billion. Its export is expected to increase at 10 percent per year and it is expected to be over $5 billion by 2015. Additionally, the U.S. Commerical Service will provide U.S. companies with preshow and onsite business counselling services. For more information contact Jill Johnson at jill.johnson@agma.org. Company Profile: Buffalo Gear, Inc.